Democratic Alliance take shock landslide victory in South African elections, suggests exit poll. According to the results of an exit poll conducted during the National and Provincial elections yesterday and published after the ballots had closed in the late evening, the DA is heading for a unprecedented landslide victory over the much-fancied ANC and seems likely to take as much as 94% of the vote. The exit poll was taken outside the Polling Station at St. Laadedah Primary School in Cape Town’s upmarket Constantia suburb by independent survey company Census Reviews and Polls (CRaP) and showed that of sixteen voters leaving the station who expressed an opinion, fifteen (93.75%) had voted for the DA. I recognise that this is just one exit poll, but if we extrapolate the results from this significant survey, we can see that it is obvious that our policies and campaign strategies have borne fruit. A 94% share of the vote is significantly up from our showing at the last election, which was 12%, and I think we can put that down to our hard work in offering the voting public a viable alternative the Jacob Zuma and the ANC. With this landslide victory, we can work on putting those policies into action as we will presumably control nine of the nine provinces which were contested as well as the national government. 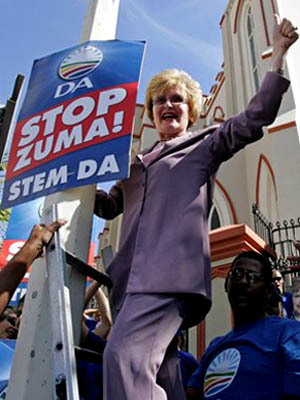 In fact, with sure a significant majority in these South African elections, I see this as an opportunity for the DA to move into the rest of Africa and envisage Helen Zille as being Supreme Commander of the World by 2015. It’ll take a bit of tinkering with the Constitution, but that won’t be a problem with this sort of majority. In fact, according to the exit poll, Jacob Zuma’s ANC have been wiped off the South African political map completely, having gained exactly 0% of the vote in Constantia Ward 76, while newcomers the Congress of the People (Cope) managed just 6%. I have to say that we were hoping to make double figures in this election. The party is just four months old, but I though we had gained more popular support than this on our anti-corruption ticket. However, looking at the overall result, I think it will finally lay to rest the rumour that we were going to enter into a coalition with the ANC after the election. They clearly have less to bring to the table than we thought they would. Well, absolutely nothing actually. Not a sausage. Shame. Other large parties who, according to the CRaP poll, failed to get a single vote nationally included the Independent Democrats (ID), Vryheids Front Plus (VF+) and the Inkatha Freedom Party (IFP). The Afrikaner VF+ were however, quick to disregard the results the Constantia poll though, saying that they preferred to base their predictions for the final outcome on an exit poll from Durbanville in Cape Town’s Northern suburbs, in which they had polled 100% of the votes cast, based on a sample size of 3. Yet that’s seemingly been the sole aim of Helen Zille and the Democratic Alliance over the past, final week of campaigning before the election. And it’s a tactic which has drawn criticism from many quarters for it’s negativity and single-minded determination to go after JZ, while there are plenty of other major issues and challenges which need addressing in this election. Zille and her grand plan. Sadly, it’s also a campaign which, as the international community sits up and takes notice in the run up to the election, has been reported around the world, with Zille’s scaremongering tactics dragging the country’s name further through the mud. See the New York Times’ report and the BBC’s South Africa ‘doomed under Zuma’. The latter is worth a look if only for the picture of Zille’s cabaret act – the article itself makes depressing reading. This evening on the way home from a hard day’s science, I listened into John Maytham’s show on 567 Cape Talk. Maytham described himself as “revolted” by the Stop Zuma campaign and stated that he had been put off voting for the DA. Then, in a shock move for me, I found myself agreeing with Maytham’s guest Jonathan Shapiro – the cartoonist otherwise known as Zapiro. But what surprised me more was that Shapiro, who was apparently previously an ANC voter but who will not be voting for them this time because of Zuma’s reputation, was also disgusted by the DA’s recent campaign, describing it as a “terrible mistake”. Strong words indeed from a man who has himself been accused of harbouring a vendetta against Msholozi. While he said he was still undecided about who he was going to vote for, the DA had joined the ANC on his list of ‘definitely nots’. I don’t understand why the DA has suddenly taken this route. They are absolutely capable of winning the Western Cape in this next election, which was their stated aim. But whatever strategist persuaded them that moving away from campaigning on any other issue and concentrating on the futile task of “stopping” Jacob Zuma – whatever that means, anyway – has done them a great disservice. As far as I can see, having spoken to people, read newspapers and checked in on the local media, this negative campaigning has turned the voters away from the DA, Maytham and Shapiro being the latest examples of this phenomenon. If they had nothing to fight for, that wouldn’t be a big issue, but with the Western Cape as tight as it is, I can’t help but wonder – have Zille and the DA shot themselves in their collective feet by solely (no pun intended) going after Zuma? Author 6000Posted on April 20, 2009 November 2, 2016 Categories annoying people, elections, politicsTags DA, helen zille, negative campaigning, stop zuma41 Comments on Stop Zuma? OK, so he may have other things on his mind today, but Jacob Zuma must also now face the fact that ex-pats are going to be voting in the April 22nd election, as predicted in 6000 miles… January 27th post. Following court applications by opposition parties (namely the DA and the VF+), the Independent Electoral Commission (IEC) backed down on its initial refusal to allow ex-pat voting and – as long as interested people overseas registered their interest by the end of March – allowed them to vote. Well, the numbers are out and Jacob Zuma and the ANC must be quaking in their boots. A total of 16,300 people are now registered to vote overseas. Assuming a reasonable turnout on the day of say, 50%, that’s about 8,000 votes shared mainly (presumably, anyway) between the DA and VF+. Scary numbers, indeed. Yes, yes. I recognise that this was an exercise in exercising one’s rights, but honestly, what an utterly pathetic waste of time and money: like the political version of Earth Hour. I am completely unsurprised that the parties involved have failed to mention the numbers, because frankly, they’re embarrassing. Compare and contrast their response with their spin about “standing up for voters’ constitutional rights” and the fanfare when they won the court ruling over the IEC. You can’t spin figures this poor. I’m putting this one down as an own goal of note. Author 6000Posted on April 3, 2009 April 3, 2009 Categories annoying people, elections, politics, this is south africaTags DA, elections, expats, VF+1 Comment on Look out Zuma!